Spring Training Vacation Planning Starts Now! With clear, blue skies and comfortable temperatures from the mid-70s to mid-80s, Mesa is the perfect place for Spring Training, just ask the Chicago Cubs and Oakland A’s! While the rest of the country is looking to a groundhog to predict when the snow will melt, players, coaches and fans revel in sunshine, Cracker Jacks and heart-pounding baseball games every March in Arizona. 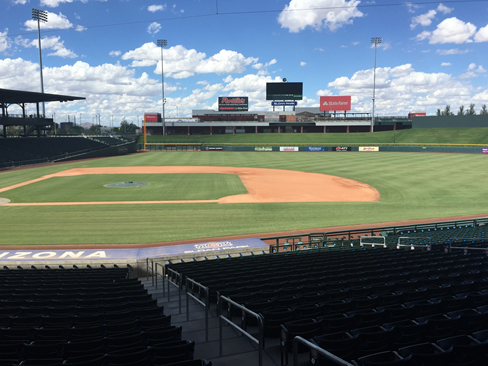 This will be the Cubs’ third season in their new home, Sloan Park and the Oakland A’s will batter up for a second season at their newly renovated home, Hohokam Park. Mesa is in the heart of Arizona&apos;s Cactus League Spring Training action with more than 200 Major League Baseball games in just 30 days, so you&apos;re sure to find plenty of chances to catch America&apos;s pastime in City Limitless®! Tickets are on sale for both the Cubs’ and the Oakland A’s Spring Training, so check out these great hotels below and choose your dates to make the most out of your Spring Training vacation, now! Stay in the heart of it all at Best Western Plus Mesa. The hotel’s central location offers easy freeway access, making all major attractions a breeze to get to. Complimentary Wi-Fi, hot breakfast and parking make this hotel a triple play for visitors. It’s a home run when you stay at the Holiday Inn & Suites! Offering a resort style pool ideal for lounging in, complementary access to Firebird Crossfit next-door and a newly-renovated on-site fitness center, Holiday Inn & Suites promises options to keep you active during your stay. The Days Hotel Mesa offers affordability during your Arizona stay with all-inclusive pricing for amenities. A TripAdvisor Certificate of Excellence recipient, the Days Hotel is a fan favorite during Spring Training for its great value. The Ramada Mesa boasts 10 acres of lush courtyards and gives guests a chance to relax in its heated outdoor pool and two hot tubs. The Ramada offers complimentary high-speed internet, continental breakfast and free parking; boasting both affordability and comfort! Whether you’re a Cubs or an A’s fan, each of these hotels area home run when it comes to offering a great place to stay during Spring Training. Once you’re here, make sure you share your photos of #MesaCityLimitless with us on Instagram. We’d love to see pictures of your adventures and at the games, too!